The High Impact accessory for the GlideStop, takes the shock that other stops just can't handle. Our heavy duty design features dual springs, heavy steel construction, a 30 lb. preload, and bronze bushings for long life. This item is serviceable as well, it can be dismantled, cleaned, and reassembled with ease, using standard tools. 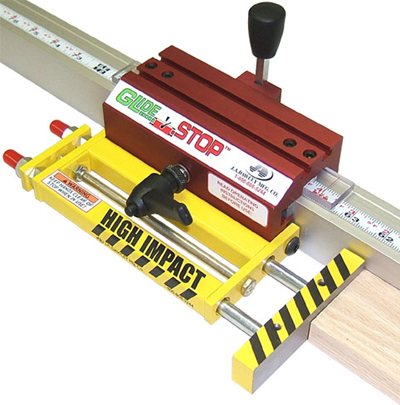 This is a must have if your shop demands accuracy and handles materials of considerable mass. At IWF 2006, one of the High Impact GlideStop's withstood over 47,000 impacts with no registered movement.